"After Delia's death [...] I cleared the house and removed all of the tapes from the attic, then drove down to London and handed them over to Brian, together with all of the papers I had found which were related to her music. Brian then passed all of this on to Mark Ayres, the Radiophonic Workshop archivist." “When Delia died, her partner Clive discovered all these boxes in her attic, just numbers of tea chests and cardboard boxes all falling to bits, all full of tapes which one day had sticky labels on them but all the sticky labels had fallen off and were at the bottom of the boxes so we were just left with hundreds of reels of tapes and the labels, so it was a real jigsaw puzzle. “When Derbyshire left the BBC in 1973, she emptied boxes of papers and tapes from her office into her car. They remained untouched in her attic. ... Following her death, Brian Hodgson suggested to Clive Blackburn, Derbyshire's partner, that Ayres be appointed to catalogue the almost 300 tapes. In March 2008 Mark gave them on permanent loan to Manchester University in the care of Dr David Butler. They were almost all digitized by Louis Niebur and David Butler in the summer of 2007 by playing them on a 1960s Studer A80 tape machine lent by the BBC's Manchester studios. 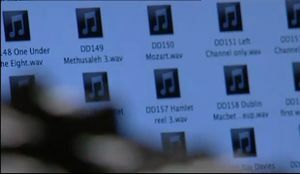 They contain the audio for dozens of pieces of Delia's music that were believed lost, including at least one Macbeth, the medleys she made for the ICI Fashion Show and the Brighton Festival, Le Pont Mirabeau, for Hamlet, Medea and Raven and Dove, as well as Lowell but in the years since they were digitized, nothing has been published. 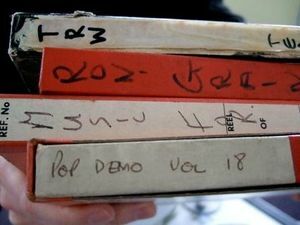 Mark Ayres' Initial Catalogue numbers them DD123 and records the labels on them and gives a brief description of each. There is a summary on the page DD. The John Rylands Library's catalogue says "This material is currently uncatalogued. A provisional list may be viewed in person at the Library". In fact, they have been catalogued as CDD/1/2/3 and so on, as listed in James Percival's thesis but the library catalogue hasn't caught up yet. There are hundreds more tapes of unpublished Delian work at the BBC, listed here on page TRW. From 2008 to 2016 you had to go and sit in David Butler's office while he played them to you on his laptop. In early 2014, the university was given money to set up listening stations in the university library. They eventually appeared in early 2016. Anyone over the age of 18 should now be able to listen to them by going in person to the John Rylands Library at the University of Manchester. ↑ Mark Ayres speaking in the Sculptress of Sound BBC TV programme. ↑ Mark speaks again about the Attic Tapes in an interview made for These Hopeful Machines. ↑ In Delia Derbyshire's Creative Process, p.11, James Percival attributes the digitization to Mark Ayres and Louis Niebur, but without giving a source for the claim. ↑ The web page for the first Delian presentation on novars.manchester.ac.uk. ↑ Heard by Martin Guy during a personal visit to Manchester in 2010. ↑ Message from James Percival in the Delia Derbshire mailing list. ↑ Listening to the Delia Derbyshire Archive on the John Rylands Library Special Collections Blog. This page was last modified on 22 January 2019, at 13:22.